While this device remains a complete mystery, one thing is certain, Motorola is going to play out this RAZR styling of phones until the end. 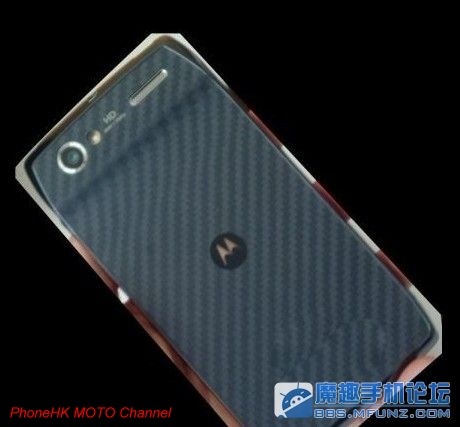 In the latest leak of a Moto product out of China, we have a device that looks somewhat similar to the DROID Fighter we saw last weekend, only it’s missing branding, appears to have hardware soft keys and one of the bigger chins in recent history. The Mfunz and Phone HK threads that they were posted in mention the word “Blade” as a potential name. It’s tough to tell if that was a Google translation from “razr” or is actually the name. After “RAZR,” the name “Blade” would certainly fit the scheme of things, especially with such similar styling. So on the front we have what appears to be a massive screen and camera. It does look like there is room for hardware soft keys though, rather than the on-screen versions we believe we see on the Fighter. The back side contains the kevlar covering that has become standard, however, it runs almost edge-to-edge unlike the current RAZR models. The rear camera is “HD” and could be 13MP, like similar HD devices from Motorola in China. From the side, this phone appears to be about as thick as the RAZR MAXX, so it’s probably safe to assume it packs a similar 3300mAh battery inside.